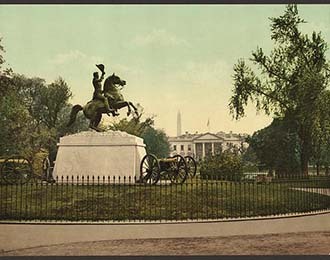 Lafayette Square in Washington DC is a 7 acre park located immediately North of the White House, the centerpiece being the equestrian Andrew Jackson Statue. Once the epicenter of elite society, today it is a historic and beautiful city park. Preserved as a National Historic Park between 15th and 17th Streets NW, Lafayette Square allows you the most up close and personal view of the White House on the North Lawn. It is one of the top locations for both political protests and picnics, and should be sought out on a nice day by residents and visitors alike. Closest Metro Stations are Farragut North and McPherson Square. Three of our DC walking tours pass through this area, the Lincoln Assassination Tour, Haunted History Ghost Tour, and our American Scandal walking tour.